Authors:Margaret McWilliams, Ph.D. McWilliams, R.D. McWilliams Ph.D. 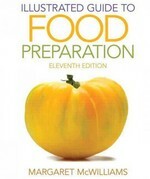 Illustrated Guide to Food Preparation 11 Edition Uniting scientific and aesthetic principles with laboratory realities, students learn about the distinctive characteristics of a wide range of ingredients, and develop the skills and knowledge they need to cost-effectively create delicious and nourishing dishes. Reflecting society’s growing focus on locally-grown foods, phytochemicals, and weight control, ILLUSTRATED GUIDE TO FOOD PREPARATION, 11/e deepens its emphasis on preparing fruits and vegetables in appetizing ways. Throughout, recipes have been tailored to minimize calories and maximize appeal. Many are integrated in an updated meal management chapter showing how to create appealing, nutritious dishes within tight budgets and schedules. Topic coverage includes: fruits/vegetables; salads/dressings; sugar, starch, cereals, and eggs; meats, poultry, and fish; breads, cakes, cookies, and pies; beverages, and preservation.